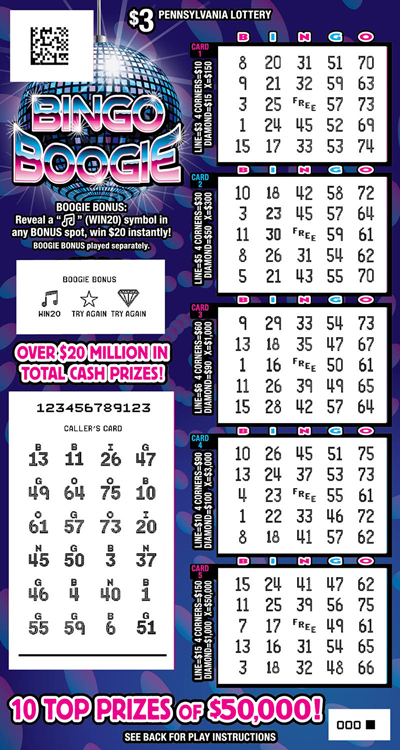 Bingo Boogie is a $3 game that offers 10 top prizes of $50,000. Scratch the CALLER'S CARD area. Then scratch only the numbers on BINGO CARDS 1-5 that match those revealed in the CALLER'S CARD area. The center spot on each BINGO CARD is a FREE space. When each matched number on a BINGO CARD is scratched, the square will turn white. When all numbers are completely matched in a horizontal, vertical or diagonal line, 4 corners, diamond or an X pattern on any individual BINGO CARD, win prize shown for the matched pattern in the appropriate legend next to that CARD. 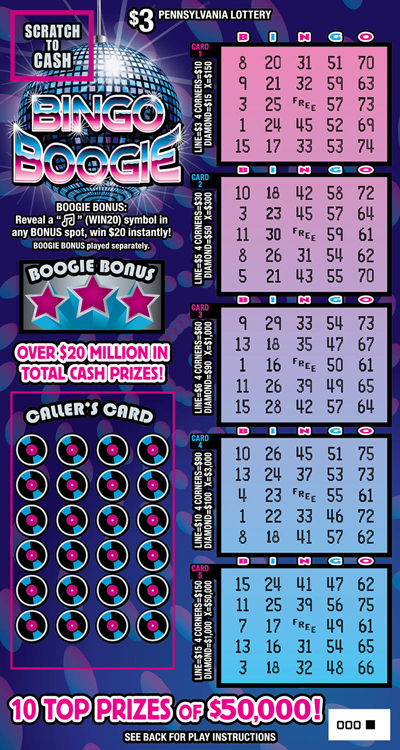 BOOGIE BONUS: Reveal a "MUSICAL NOTE" (WIN20) symbol in any BONUS spot, win $20 instantly! BOOGIE BONUS played separately.